The Bible is considered the best-selling book in history, and any good Christian knows the basic bible stories: The Creation, Noah’s Ark, David and Goliath, the birth of Jesus, etc. However, it’s also very easy for people to not know much more than those few stories because the size and language of the Bible can prove to be intimidating for beginners. Even hearing the readings at Mass can cause confusion for someone who doesn’t understand the context of the passage. A way to solve this problem? 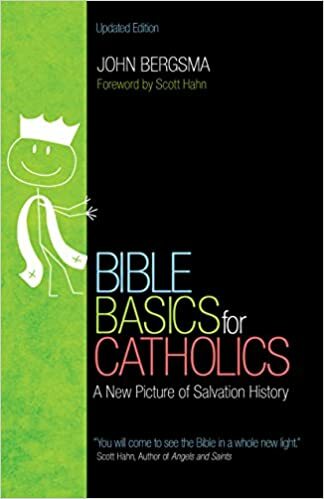 Introducing “Bible Basics for Catholics” by John Bergsma. In this handy book, you will be treated to a tour of the frame story of the Bible, God’s plan of salvation history from Genesis to Christ. Filed with helpful stick-figure sketches for simple illustration and clarity, “Bible Basics for Catholics” places each major event in the Bible in its proper order and context and tracks the covenants that God made with His people and how it all relates to our lives. You’ll learn the role of every human as priest, prophet, and king, identify with the great figures like Adam, Moses, and David, and come to a stronger realization of the Bible, history, and yourself.